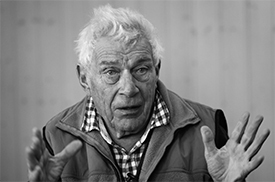 Prolific artist, philosopher, writer, storyteller and "radical humanist" John Berger is the focus of this vivid four-part cinematic portrait. In 1973, he moved from urban London to the tiny Alpine village of Quincy. THE SEASONS IN QUINCY: FOUR PORTRAITS OF JOHN BERGER examines different aspects of Berger's life in this remote village in the Alps. In four seasonal chapters, the film combines ideas and motifs from his work with the texture and history of his mountain home. Tilda Swinton, a longtime friend and collaborator, joins Berger for a frank and revealing conversation. Berger's seminal writing on animals is illuminated by local farming practice and set alongside other philosophical approaches to animal consciousness. Directed by Christopher Roth. Berger is joined by writers Ben Lerner and Akshi Singh along with Colin MacCabe and Christopher Roth for a lively political discussion of our present moment and its relationship to the past. Berger's son and Swinton's children join their parents for a visually rich journey to Quincy from the Scottish highlands, seeing the countryside anew. United by their central vision and an original score by Simon Fisher Turner, the four short works that comprise THE SEASONS IN QUINCY beautifully combine to make a feature film. A filmic journey starring Tilda Swinton as she traces the former Berlin Wall via bicycle. Critic and writer John Berger and photographer Sebastião Salgado lead this searing examination of imagery and images, the abyss, hope, and globalization.